Feminine name Bhumika literally in Sanskrit 'role played for any play'. In Sanskrit Bhumika also means introduction, earth, step. Bhumika Chawla is an Indian actress. She made her film debut in the Telugu film Yuvakudu (2000). Bhumika (The Role) is a 1977 Indian film directed by Shyam Benegal. The movie stars Smita Patil, Amol Palekar, Anant Nag, Naseeruddin Shah and Amrish Puri. Sanskrit name Homagni means sacrificial fire from Sanskrit h..
Sanskrit Name Vana (Sanskrit वन) literally means forest or c..
Sanskrit name Bhuvnesh भुवनेश means Lord of World. 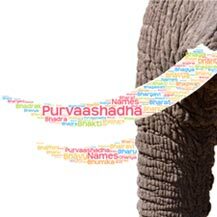 Bhuvana (Sanskrit भुवना) is derived from an ancient Sanskrit.. Ancient Sanskrit word Uditi (Sanskrit उदिति) refers to the r..
Ekaja (Sanskrit: एकज) is a Hindu/Sanskrit Indian popular fem..
Gatu deived from Sanskrit word gAtu means singer, song or mo..
Eka (Sanskrit एक) is an ancient word of Sanskrit origin whic..